Travel memoir of a Chinese coastal city. 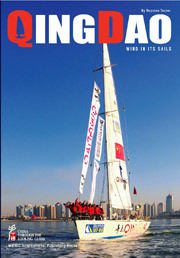 "In mandarin, the name of this sailing city can sound like "Please come to…" as well as "green island" — which is a fitting ambiguity — and very much an invitation: Qingdao, Qingdao. Such a beautiful resort on China's NE coast, yet the spot is little known beyond the mainland and its Yellow Sea reach: Korea, Japan — and is referred to as "Little Switzerland" or "Bavaria" for its unusual, European architecture, mountain scenery, beaches and emerald waters. Greater Qingdao is also home to some remarkable ancient treasures and sites — over 6,000 years old — as well as hot springs, ski-ing, and golf, easily accessible from the urban downtown… Qingdao is a remarkably inspiring green island on the Shandong Peninsula. It will leave you as it did me…with the craving to look again…and a memory of yachts at full sail in Fushan Bay. You, however — with this book in mind — will also see what you see. And far more than I."